1523 P.Aaron’s “Thoscanello de laMusica” fully explained. 1571 Zarlino contributed for the tuning system. Meantone resolves the 5th of D-A (which is out of tune) of just intonation, and set pure 3rd in 12 tones of the keyboard as many as possible. This tuning system is for pipe organ in time of Renaissance, in order to get strict dignified sound of church. Pythagorean system was used before mean tone. But in the music of Renaissance,the harmony started to be used. Pythagorean system constructs a strong howling on this 3rd. This makes a feeling of dissonance. Divide this by 4 (2786/4=696.5) and make a narrow 5th and make a pure 3rd and this is the system of meantone. but can not avoid to make a “wolf” at the end, and also 4 major 3rd out of tune. In order to fit many keys, Cembalo with two divided keys of G♯/A♭ and D♯/E♭ was made. From this fact, we can see that meantone system was widely used. This is the time when basic of Western Music was made. 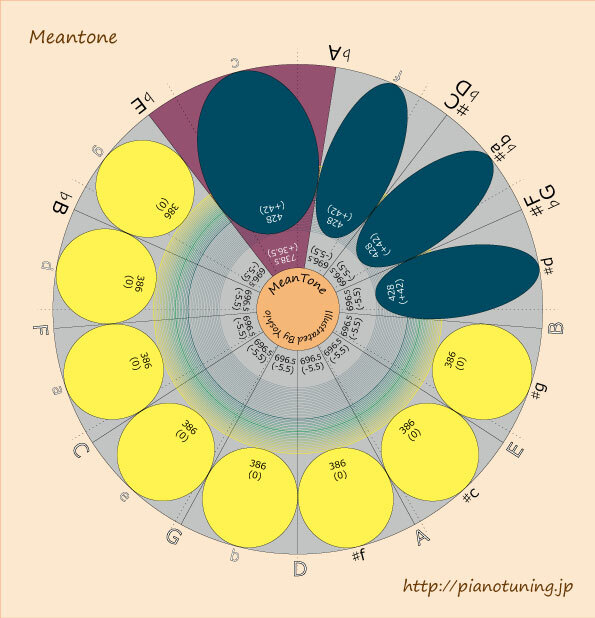 Meantone could be the root of classical temperaments of Baroque Music. Refrence : Transition from pipe organ tuning to classical temperament.